The international airport is Keflavík, about 45 minutes drive from Reykjavík. Busses go regularly between Keflavík and Reykjavík (http://www.re.is/Flybus). The bus stops at the BSÍ bus terminal (see map below). The summer school begins on August 20th in the evening. 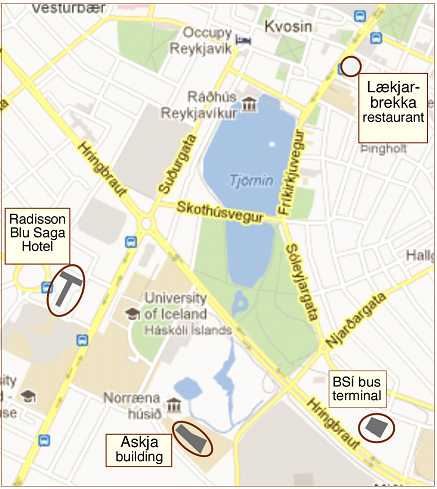 We meet at 18:00 in Askja building (University of Iceland) for a short get-together followed by a dinner at Restaurant Lækjarbrekka in the center of Reykjavik, about 10 minutes walk from Askja. At Askja we will briefly introduce the summer school program and hand out name tags for the participants. A folder with the summer school program, a short field guide and a memory stick with abstracts and selected papers will be handed out in the bus on the first morning. Accomodation has been arranged during the summer school from August 20-28th. Those arriving earlier or leaving later make their own arrangements. Food (breakfast, lunch, dinner and coffee) is included in the course. Wine and beer is not included. Everyone will need to share a room with some one. The summer school consists of four days of lectures and four days of field excursions. Lectures will generally be about 45 minutes. The first field trip is on August 21st as we drive from Reykjavík to Leirubakki. All field trips will include bus drive and some hiking. The stops are at exposures into soil with tephra layers or tephra deposits. Posters will be up during most of the course with special poster sessions at the end of each lecture day. Each participant will be asked to briefly introduce their posters during one of the poster sessions. Warm, wind- and waterproof clothes are necessary - the weather in Iceland varies a lot. Sunny days as well as windy and rainy (even snowy) days can be expected. Some of the field trips will take us into the highlands where temperatures may be close to 0°C in the night. Make sure you bring warm clothes and waterproof jackest and trousers, as well as shoes/boots appropriate for rocky and/or muddy terrain (sturdy hiking boots). Bring swim suits, there is a hot pool at Hotel Leirubakki and a swimming pool next to the hotel at Kirkjubæjarklaustur.